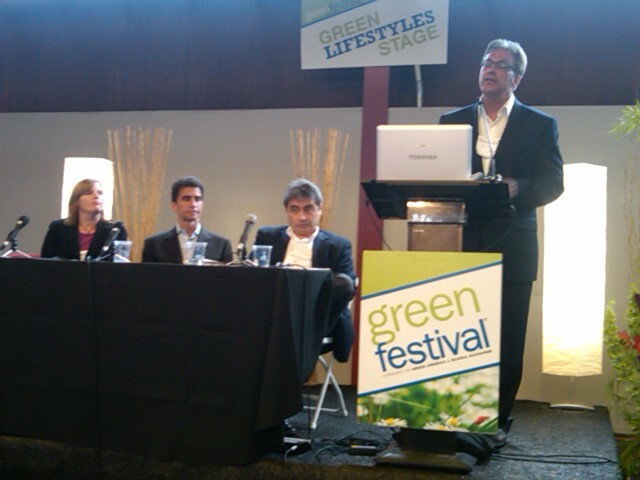 A major theme at this year’s San Francisco Green Festival was what we as individuals can do to promote sustainability. But what’s government’s role? I attended a panel on this subject with representatives from the federal, state, and city levels. The federal government can play an important role, as Enrique Manzanilla of the EPA described. Grants from the EPA, which is partnering with HUD and DOT, help promote smart grid growth, green buildings, environmental workforce and job training, and much more. When we get to the state and city levels, more details emerge. State Senator Mark Leno told us about a measure to put solar on the roofs of public buildings in San Francisco. The installations are funded using the ingenious idea of revenue bonds, which are paid back by the revenue stream created by the energy saved in these buildings. And a new law allows excess energy generated by solar installations on municipal buildings to be used for new municipal projects, such as schools. Melanie Nutter, Director of San Francisco’s Department of the Environment, talked more about what the city is doing. At 77% recycling, we’re leading the country. Local green programs have created jobs and saved energy for many homes and businesses. The city’s sustainability initiatives incorporate social components, such as providing green job training to low-income parents. And the green building program’s ambitious and wonderful goal is for buildings to reach a level of sustainability that would make the term “green building” meaningless — because they’d all be green. Supervisor Ross Mirakami added that while it’s great that AB32 was upheld in the recent elections, it does the bare minimum. That’s where local government can step in and take action, as San Francisco is doing with a climate change bill that aims to go beyond the requirements of AB32. San Francisco was also the first city in the country to enact a plastic bag ban, which is encouraging other cities to attempt similar measures. In more than one way, we’re showing how a single city can provide an example for others to emulate. We’re making strides at all levels of government. While the federal government has its limits, it sounded to me like the EPA is able to accomplish more now than when I worked there briefly during the Reagan administration. On the state level, not only has AB32 been upheld, but we’ve elected a governor who’s likely to support green legislation. And San Francisco is leading the country in all kinds of green innovations. We can’t leave everything up to the government, as Bill McKibben and John Perkins emphasized in their own talks at the Green Festival. But some things need to be done by government, and it’s good to know that ours is taking some positive steps, especially at the state and local levels. This is particularly important in California, because our state is a leader that can set the tone for the rest of the country and even beyond. I look forward to seeing what can be done with a new Democratic governor. And I expect that at next year’s Green Festival, we’ll hear about more impressive accomplishments.